I lay alongside a fence yesterday - trying to hide a little behind a small clump of thistles. I'd settled down for a long wait since I'd just walked right past - so that I could get downwind of it - the very burrow I was aiming at. But I didn't mind; I'd spent a few days trapped in the flat due to a prolonged bout of wet and blustery weather, so lying in a field seemed like a happy thing to be doing. A very small rabbit soon scampered in and out of the burrow but I didn't shoot at it; walking up the field I'd seen a grown-up one there and I was hoping it would soon grow brave enough to venture outside again. I waited some more. A woman walking a Labrador appeared at the far end of the field and started heading towards me so I got up and - waving - announced my presence (I saw the big rabbit as I stood up, its head just sticking out of the burrow and eyeing me with what might well have been astonishment). It is a little bit irritating to have to give up after twenty minutes of silent camping, but I do feel as though I have to make a priority of keeping on good terms with the people who also use the land that I'm lucky enough to be able to hunt on. 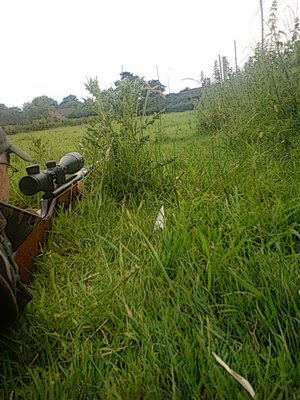 (James Marchington has posted a very interesting and sobering article about a chap who managed to fall very badly foul of the walkers that crossed the land where he was shooting.) The woman and I had a cheerful chat about the weather and the rabbits - me all the time trying to keep her dog from slavering over my groin as we did so - and then we went our separate ways. I didn't have any luck at all the rest of the afternoon; I've changed pellet brand and I haven't done as much zeroing as I'd like, but I think it's as much a question of confidence as it is of getting the shot in the right place. I've gone back to RWS Superdomes and not because I think they're hugely better than H&N field target or anything - it's just that I've run out of H&N's and I can't face splashing out eleven whole quid on a new tin right now. I've already got a 3/4 full tin of Superdomes - so they're what I'm going to be shooting for a while. Hubert Hubert, I love reading the tales of your rabbit hunts. Rabbit hunting is a rare thing for me - I have to go quite a ways to do it - and it's completely different terrain. I wish I could step out and do it more often. Dang dogs! Crotch sniffing beggers! That's got to be the worse thing is when an owner can't or won't teach their dogs to keep their noses out of peoples crotches. Dear Mike, Thank you! You're very welcome aboard the good ship Rabbit Stew! Dear Cazadora, Thank you! I'm truly glad you like to read my stuff. You're a pro at this writing thing so I take it as a real compliment.